Google Docs has always been a good all-round tool for most of our simple work-related needs, such as creating documents, presentations, spreadsheets, and so on. Now integrated with Google Drive, it still offers all of the functionality and backup options. You can do a lot with Google Docs, and that includes creating Forms. Indeed, Google Forms are widely used by surveyors, journalists, and beginner bloggers to create contact forms, survey questioners, and more. In this post, we'll talk about how to create a contact form with Google Docs, and how to embed it on your blog/website. 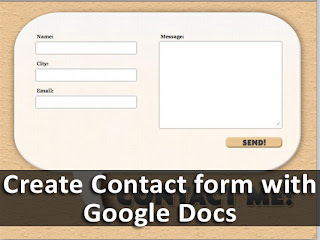 Creating a contact form with Google Docs has never been easier. In order to create a Google Form and to be able to collect responses, you need a Google Account. Follow the steps given below to create your own contact form and embed it to your blog/website. Step 7: Click on the Send Now button at the end to finish up and start sharing your form. Next to the share link, you'll see an Embed button. Click on that button, and then simply customize the size of the form. The corresponding HTML will automatically be generated for you. Copy and paste it anywhere on your blog or website, and you'll see the results as follows. 2. From the options above, goto Tools and Notification rules. 3. A pop over will open and in the options, select “Any changes are made” and from below, choose “Email Right Away”. Now if someone submits a response to your form, you will get an email notification within few seconds. thanx dude. i need that badly..
How can we customise the size of the contact form generated thru Google docs as generally it is very large whereas those generated through paid services are very professional ones. It will be great if you can let us know that how the height, width and background colour can be changed for the form.